By the time we got into Vienna, got the train from the airport to the Hauptbahnhof and made our way to the Airbnb apartment there wasn’t much of Friday left. We had dinner at a little Asian place down the road – massive menu – Chinese, sushi, Thai etc. Their red curry chicken was nice but really didn’t taste like the red curry chicken we know from Thailand or home. A visit to the Belvedere Xmas Market after dinner and we called stumps on Friday. Plans for today were really fluid – we didn’t have any specific places on our sightseeing agenda so we wandered over to the station and hoped on the #1 Ubahn train into the centre of Vienna. The plan was just to walk the ‘Ring’ and see what we found. Similar to the Paris metro, the stations are underground and some have to be accessed with super steep and long escalators. First one we came upon was Karlskirche .. and beside it … a Christmas market. Not many of the stalls were open but there were plenty of families out and the kids were having a great time in the straw round the little farmyard exhibit. 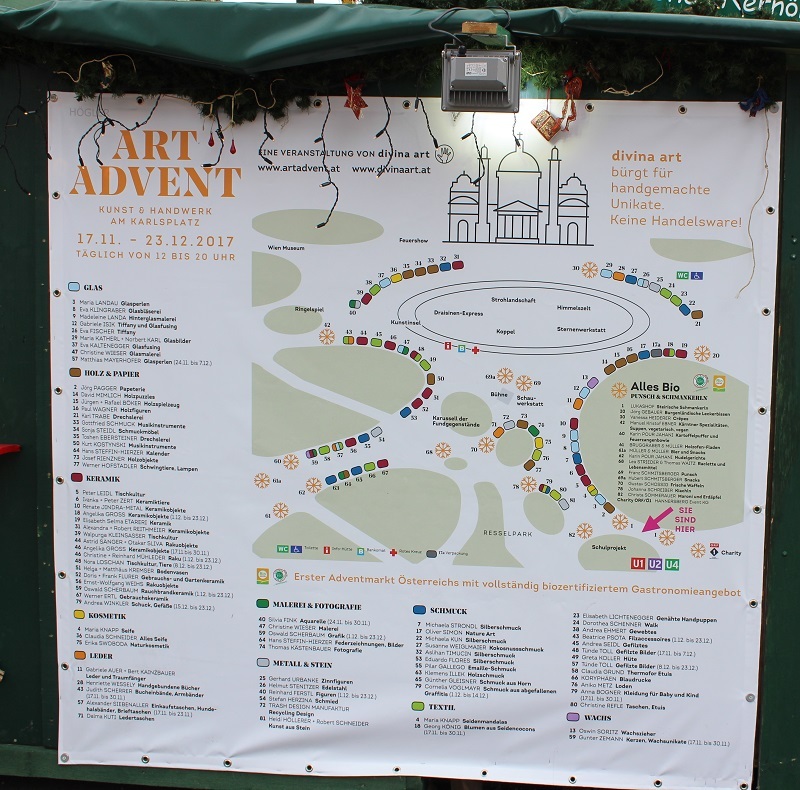 Todays two useless bit of information .. goats will eat christmas tree, and some Christmas Markets are so big they require a map. Karlskirche was beautiful from the outside but not special enough (or iconic enough) for me to part with 8euro to see the inside. So on we went. In the 13th century the heart of Vienna had been surrounded by a wall with an area about 500m wide kept clear of buildings & trees as part of the defence strategy. By the late 1700’s these fortifications had become obsolete and in In 1857, Emperor Franz Joseph ordered the demolition of the city walls and moats. In his decree, he laid out the exact size of the boulevard, as well as the geographical positions and functions of the new buildings…. And the Ringstrasse was born. It’s a beautiful road, with two rows of trees down the middle and lined with grand buildings. A popular tourist option is a carriage ride around the ring. 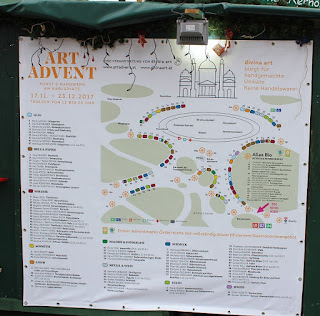 only to come face to face with the mirror facades of the Kunshistoriches Museum (Historic Art Museum) and the Natural History Museum with Maria Theresia Platz and another Christmas Market between them. Then it was on down the Ringstrasse to the beautiful Austrian Parliament building – currently undergoing renovations. They want to use existing space better (no need for coal store-rooms in 2017) and make it more environmentally friendly. And just down the road we came upon a skating track winding its way through what looked like a small park. Turns out this was the edge of the Rathaus Christmas Market in front of Vienna’s incredible City Hall and opposite the imposing Burg Theatre. We spent a good bit of time exploring and eating our way round this market – which, by the way puts everything we saw in France thoroughly to shame! By now it was going on for 4.15pm, the sun had officially set and the wind was beginning to bite. Real temp probably about 5deg, feels like ...2deg. Imagine just how utterly astonished we were to see a wedding party posing for their photos … the girls in the bridal party were in strapless gowns! And here, to share are another few thousand words to describe todays fun. Vienna you sure do know how to do a Christmas Market. We headed home as the lights started coming on. My friend Tea from school says Vienna is the most beautiful city in Europe … I can see why.